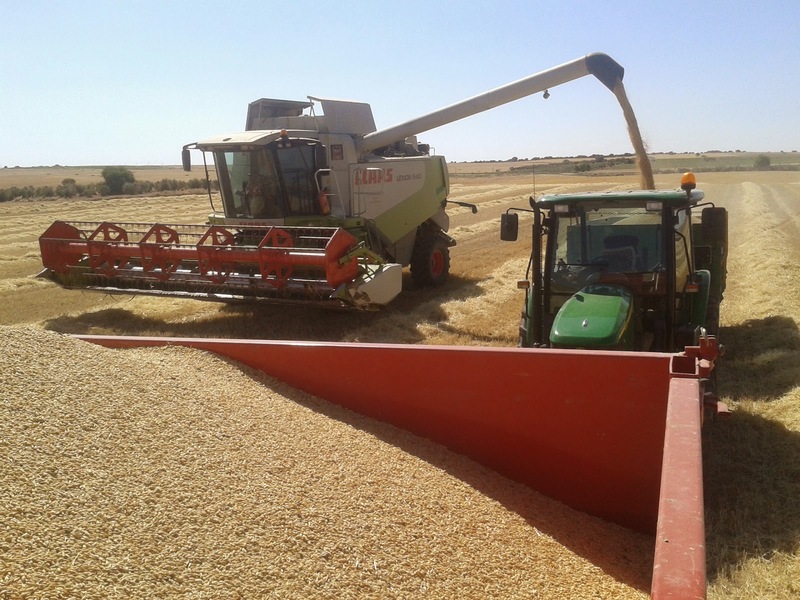 The cereal harvesting is finishing in our village, so we would like to publish some pictures about this job because it is the high-priority task in whole La Mancha. 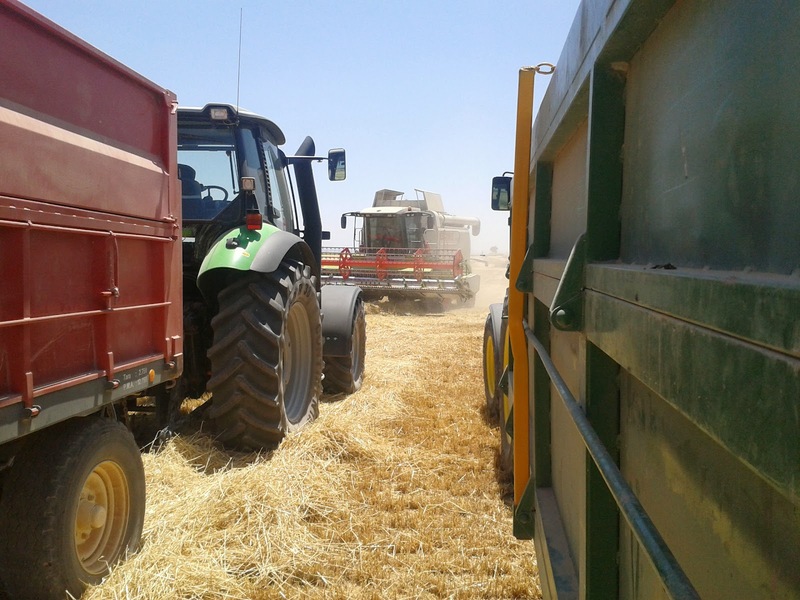 We finished it, but it wasn't easy because all combines have a lot of work. 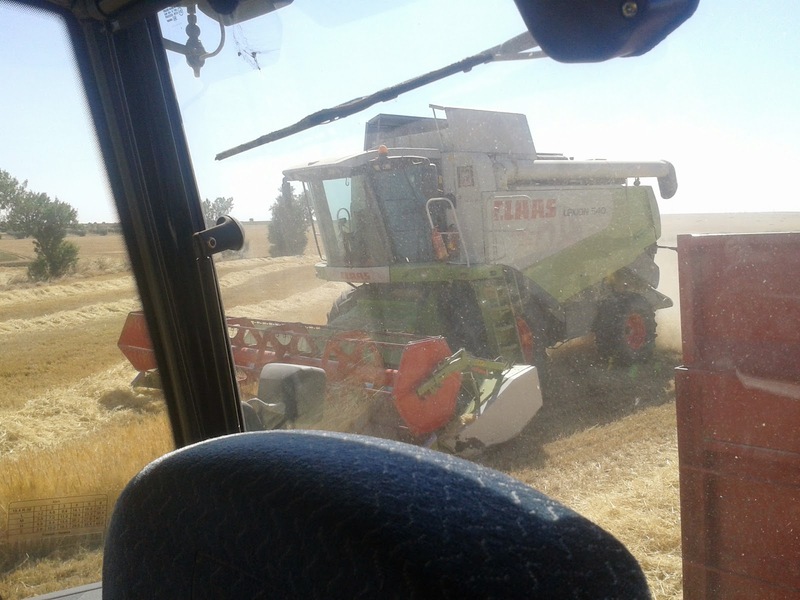 Our friend Juanjo, with his three Claas combines is very busy because he has to harvest cereals of a large number of customers and everybody is impatient for the harvesting (we are taking care of our crops all year and we wish an ideal harvesting). 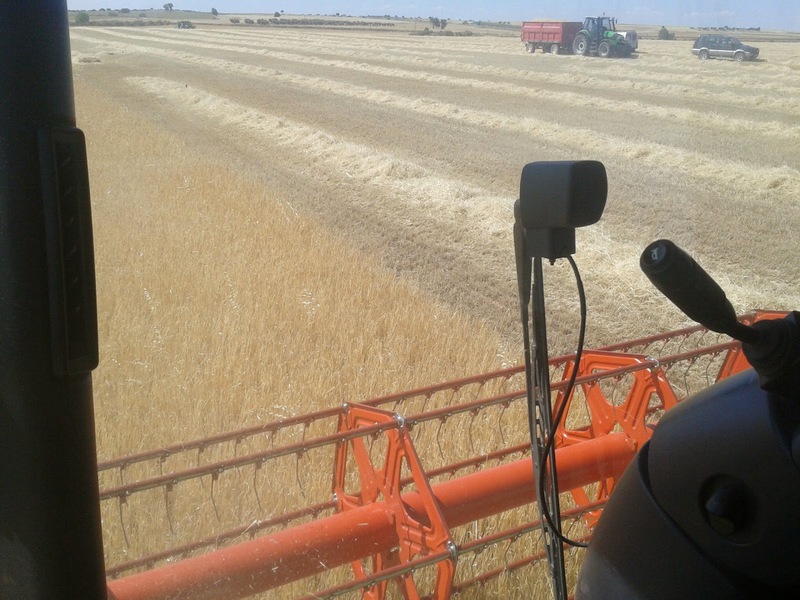 We began with barley harvesting (volley barley). 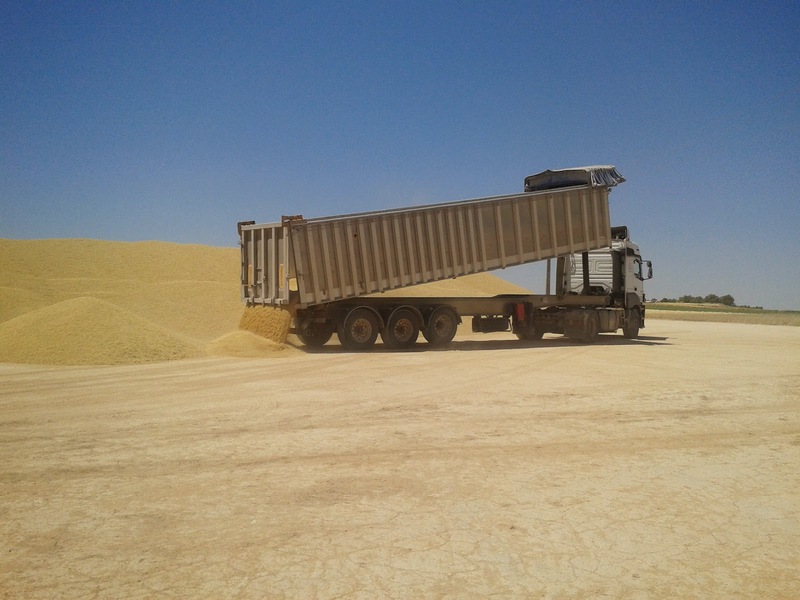 After a few working days, the results have been absolutely impressive: the average is of 4,500 kg/ha. 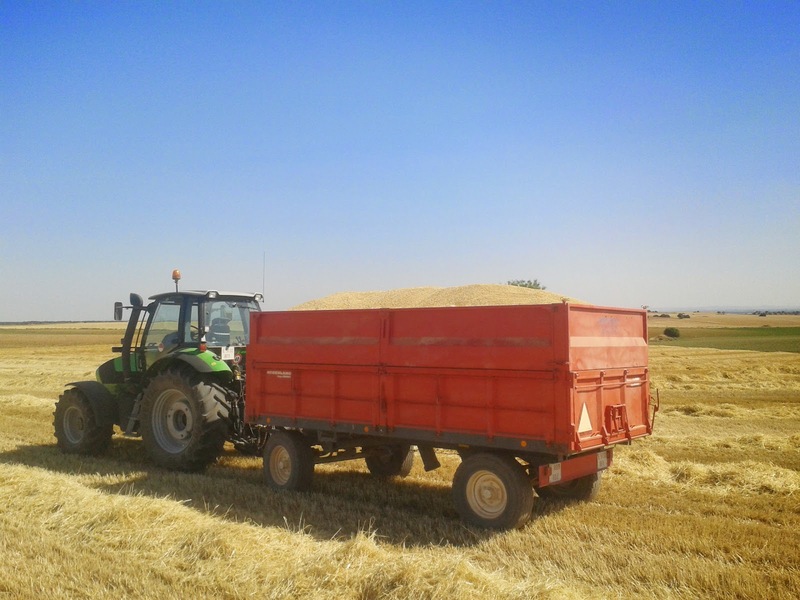 A harvesting day, Juanjo invited us for dinner on the field. We could speak with other of his customers, the old people could remember the past, when they were kids. This happened thanks to a Juanjo's picture of Claas Matador where we could see the harverster owner and Boni (the eldest man in the group)... it was really funny. 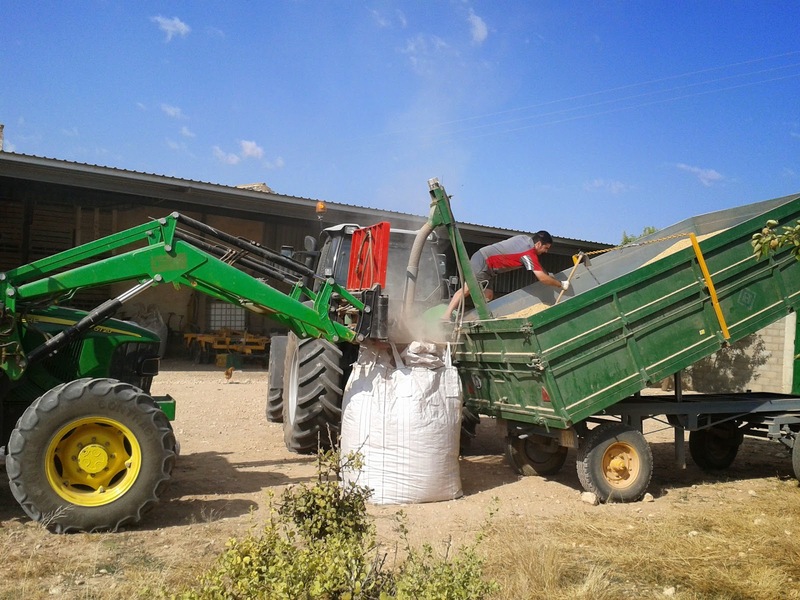 Some days after the begining, we harvested triticale and pulse vegetables. 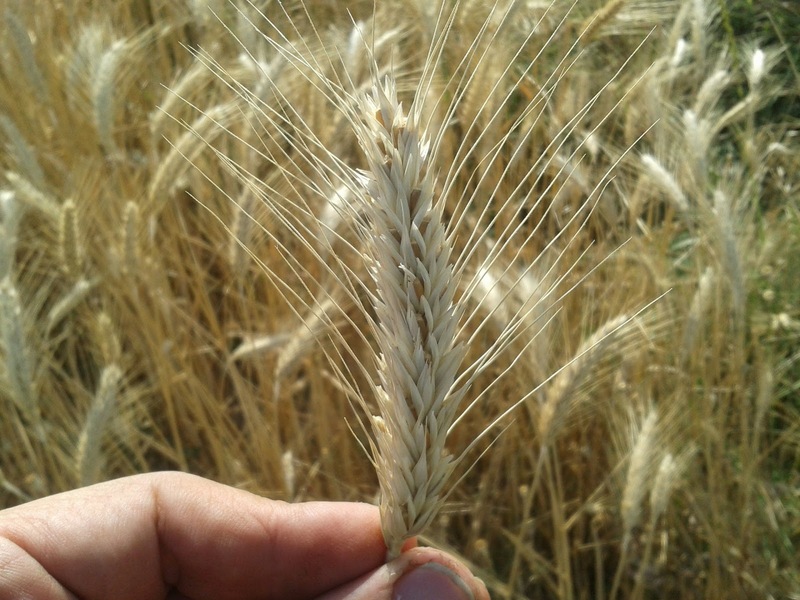 The triticale was ready to be harvested as you can see in the spike picture. 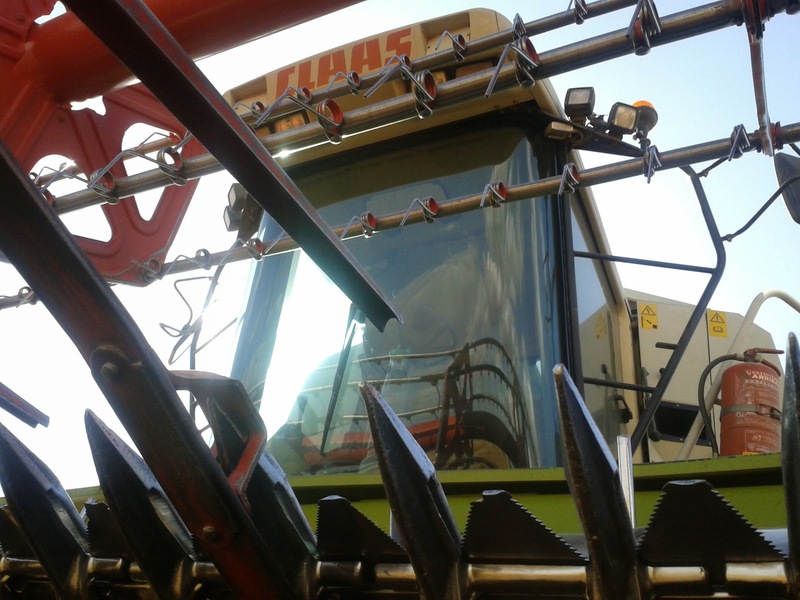 Regarding pulse vegetables, we had to fix the special tool called crop lifters located in the front of the harvester which is in charge of rising up the grain because it was dragging on the ground. 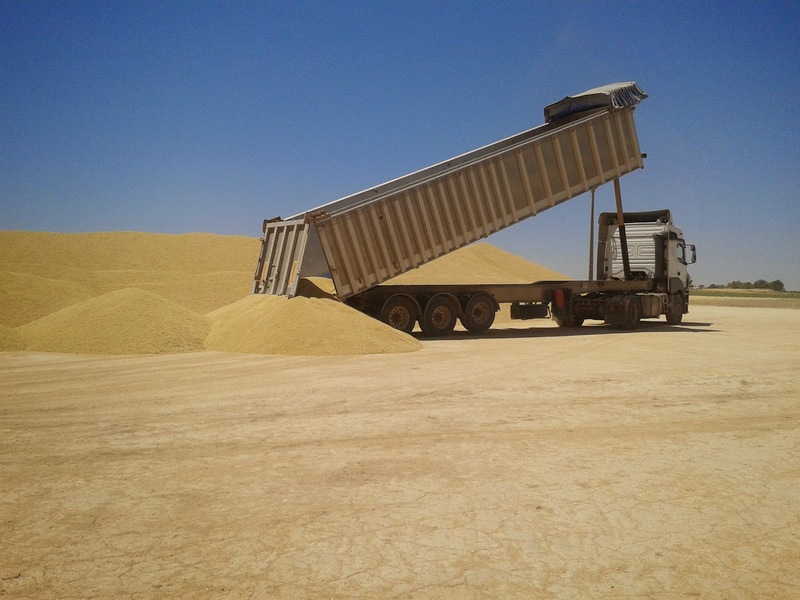 The average of triticale was of 3,300 kg/ha and pulse vegetables average was of 2,000 kg/ha. So, it is a great campaign and we hope to finish with good sales prices. 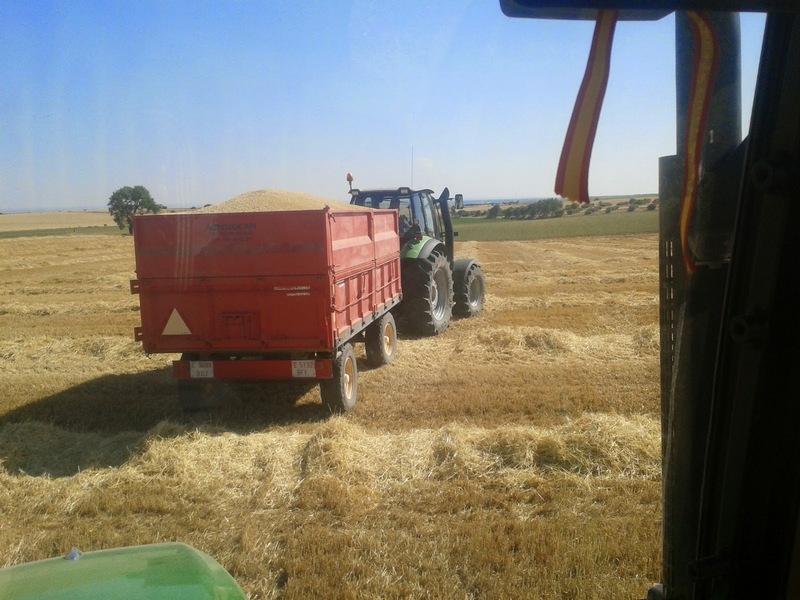 Finally, we stored some barley to sow them in November. The weather was perfect!! We wish you good luck for your harvesting tasks. Congratulations for your crop. I am very happy to see that you manage to harvest all these cereals. Unfortunately for me here in my area (Tripolis) a hail storm destroyed everything http://www.youtube.com/watch?v=xLXK4wU2agA(wheat, barley, apples trees, potatoes, ….). Most of the farmers did not harvest the farm due to very low production. Many thanks for all the photos that you have posted, especially for the crop lifters…. Please give us more info regarding them and which cereals you can harvest with them. I have to say that I admire the team spirit you have in your village and in your family. It is very nice to see people that they have a goal, and they try to achieve it. Please let me know what exactly you do with the triticale and the pulse vegetables. I assume that you use it for bread and animal feed!!!! Thank very much for your comment!! It is a very bad news for us too...We are very sorry. 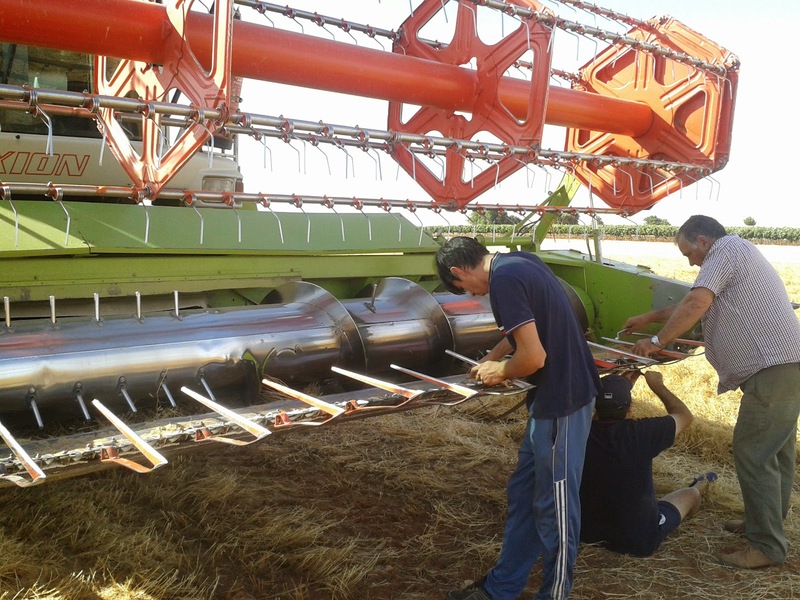 We only use crop lifters to harvest pulse vegetables... barley or wheat (cereals in general) can be harvested without problems. I almost miss this post, what would be a pity , I love seeing the crop and people enjoying the field. Thank you a lot for sharing your experiences. There is a lot of work in summer, fortunately.